How could anyone resist a dinosaur-themed race? I certainly couldn’t. 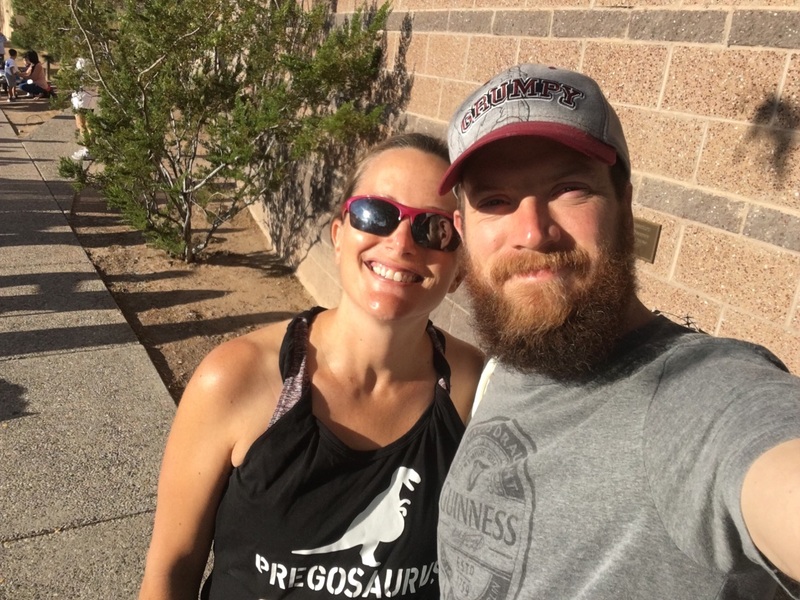 When I visited the New Mexico Museum of Natural History and Science a couple of weeks ago, I saw a flier for the Dino Dash 5k, whose proceeds go to the museum and its programs. Dinosaurs? A good cause? The race automatically became a possibility, and after the Chips & Salsa 5k went fine for me last weekend, it was officially a plan. Race morning arrived dark and chilly – probably the last race I run this year (if I run any more races this year) where I could get away with not wearing any warm-up clothes over my race attire. The seasons, they are a-changing. Robin Hood, Ann and I drove down to the museum, walked over to the start area, and then just kind of wandered a bit. I had the privilege of using a remarkably clean porta-potty – seriously, I think I may have been the first person to use it, ever. Kudos to the race directors! The race had advertised a costume contest to get folks in the spirit of the dino theme, and sure enough, some of the runners sported nifty get-ups. I admired them, but I was content to wear the tank top Robin Hood gave me a few months ago. Better wear it while I can! Aside from the theme, the race was fun because I had never run in that neighborhood before. There were lots of turns, which kept me on my toes, and in general, it was beautifully flat. My everyday running route has plenty of hills, so I feel just fine about skipping them in these 5ks, thank you very much! Plus, with the layout of the course, I got to see my support crew in the middle of the race, not just the beginning and end – always a treat. The cooler temperatures must have put a spring in my step, because my official time was 28:50 — a little faster than last week’s 5k. That was good, somehow, for another 3rd-place age group finish! PLUS, this race had an actual podium for runners to climb up on. I can’t remember ever getting to do that in a race before. 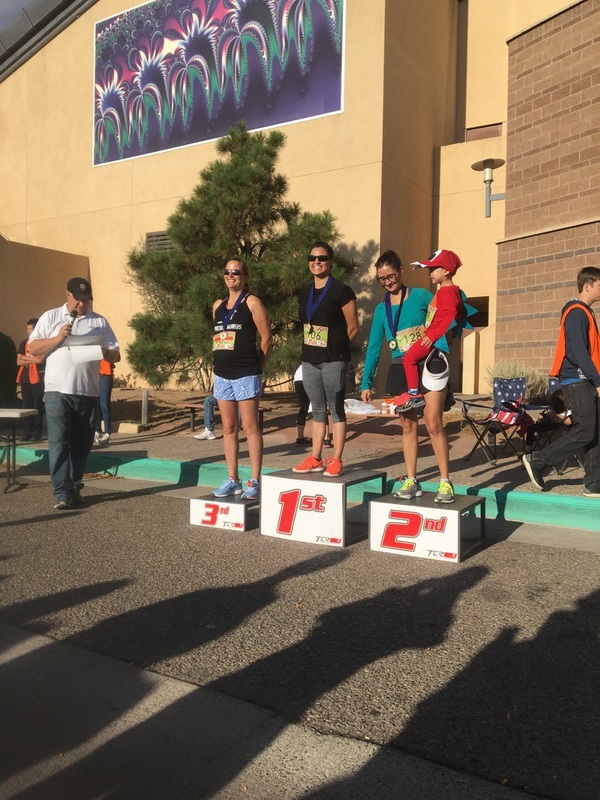 As I stood there with the top ladies of my age group, one of whom had a toddler on her hip, and had a medal placed around my neck by someone in a dinosaur costume, I felt like an Olympic medalist. SO cool. All races should have podiums. All in all, a good event from one of my favorite museums. I’ll definitely be back! Everything about this post is awesome!! Really though, dinosaurs….costumes…podiums–what a great race! Congrats!!! “Running With The Dinosaurs?” When I read the post title, I thought it would be about you running with your Father and some of his buddies! I shall have to add this one to my bucket list! As a runner myself, I like the thought of a dinosaur-themed race. Great read! How fun! Congrats on your great race, time improvement and placing! Sounds great! But how about a Breaking Bad themed race? Now that’s something I’d like to see! Congratulations on placing! Sooo, you’re saying you LOVE hills huh? Ughh hills, a necessary evil … LOL! Excellent post!